What is your favorite part of beekeeping? While I do enjoy opening up the hives, my favorite part of beekeeping is probably sitting near the hive entrance and watching the bees come and go. For me, it’s both calming and comical. If you sit there long enough, you will see bees hitting their heads on the front of the hive, flying into each other, walking on top of each other. They aren’t as graceful as you would think, but they get the job done! 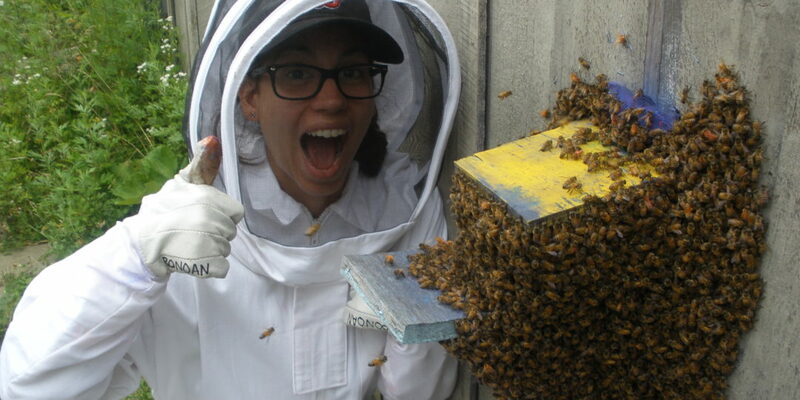 What is your least favorite part of beekeeping? My least favorite part of beekeeping is the smoker. After inspecting all 15 of my hives, my throat usually hurts and my lungs aren’t too happy. Also, no matter what I try, I struggle with consistency. Some days I can keep it smoking the whole time I’m in the bee yard. Some days, I’m constantly re-lighting it. Once in a blue moon, my lighter isn’t working so I open the hive quick without smoke, just to make sure there are no serious signs of disease. Those are the days that I appreciate the smoker, even though it’s my least favorite part. How did you get into beekeeping? I started graduate school with an interest in studying nutrition and immunity in social insects. Honey bees are a great study system for these types of questions but before I got to the research, I had to learn how to keep bees! During my first year of graduate school, I went to New England Beekeeping’s Bee School and fell in love with the world of honey bees. I have been keeping bees since the summer of 2013 and I plan to continue keeping bees, even after I’m done with grad school. Why do you think it is important to keep bees or do the work you’re doing? I study how a lack of food choices (i.e. flowers!) affects honey bee health and behavior. My research is important to both backyard beekeepers and commercial pollinators — in both cases, honey bees are sometimes forced to eat only one type of food. For backyard beekeepers, their honey bees mainly experience a seasonal lack of food choices. During the New England spring, there isn’t much for a bee to collect food from other than dandelions or clovers. In the fall, it’s mainly goldenrod and asters. For commercial pollinators, their honey bees experience a lack of food choices when they are tasked with pollinating a large monoculture of crops, such as an almond orchard. If we can better understand how a lack of food choices affect honey bees, we will better understand how to supplement their diet for naturally healthier hives. Do you have any of your own hives or family with hives? With the help of a few interns, I keep 15 Langstroth hives and 8 observation hives. I technically keep all my hives for research purposes, but one day I would like to have a backyard hive (or two) of my own. What is your favorite cool bee fact? Their alarm pheromone smells like bananas! More like the artificial banana flavoring than the real deal but still, bananas. When showing off my observation hives, I usually tell people to gently blow into one of the ventilation holes and sniff. Honesty time: are you afraid of bees? Nope! I have always loved insects (even stinging ones!) and creepy crawlies. Would you rather be a queen bee or a worker bee? Definitely a worker bee! I like to stay busy and I don’t really like to be doted on. Have you ever dated another beekeeper? My fiance has come to the bee yard with me a few times to help out but he wouldn’t consider himself a beekeeper. Favorite beekeeping location? Tufts Cummings School of Veterinary Medicine in Grafton, MA. The Tufts Vet campus has lots of open fields and wild forage for bees! I love sitting out there, away from the city, listening to the birds chirping, the wind blowing, and the bees buzzing. What is your advice for young people interested in beekeeping who may not have the space or money to start keeping bees on their own? Contact your local bee club (just google it, there is most likely a bee club in or near your hometown) and find a mentor to shadow! Some bee clubs even have their own teaching apiary. If you’re in the the Boston Area, the Boston Area Beekeepers Association holds various hands-on workshops and “hive dives” at our teaching apiary at the Boston Nature Center. Some workshops require registration but all are open to beekeepers and bee-enthusiasts alike!